It’s a good feeling when you do something and it seems to be appreciated because others found it useful and even eye-opening. That’s what we at Maverick’s New Media Division felt at the end of the day on Tuesday, after conducting our first workshop on Public Relations and New Media at the Intercontinental Hotel in Jakarta. We had 38 participants, which was great since we had aimed to sign up only 35 people. We could have tried to get more participants but we wanted to confine it to a small groups so that it would be a better learning and sharing experience. The participants were mostly in-house PR practitioners, but also included some marketing people, from an eclectic mix of industries – mining, banking, automotive, FMCG, IT, retail…and also a handful of NGOs that have been working with Maverick as part of our Social Leadership Program. The workshop started off with Unspun‘s alter ego sharing his thoughts about how he got really frightened abou five years ago when he read Naked Converations and it dawned on him that new media will eventually change the way businesses communicate with their audiences. The implication of a Web 2.0 world was that businesses could communicate directly with their audiences, thereby lessening their dependence on traditonal, mainstream media to deliver their messages to the audience. In such a world there woul be very little need for the traditional PR practitioner who, more often than not, makes his Rupiah from being the middleman between businesses, and therefore their audiences. The fear spurred him and Maverick into blogging and experimenting with other new media platforms and social media networks. 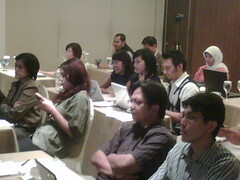 It also drove Maverick to organize Pesta Blogger. From these experiments and engagements, Maverick emerged with a wealth of experiences, contacts and networks, more convinced than ever that New Media cannot be ignored if you are a PR practitioner that does not want to have your cheese moved for you. From there the Alter Ego spoke about the new rules or marketing, PR and engagement that kicks in with New Media. Hanny, who leads Maverick’s New Media Division, spoke next about the types of audiences there are in New Media, the types of objectives that any new media initiative should consider and the types of technologies available. She then took the participants through a hands-on session on how to set up blogs, Twitter accounts, using Google Reader, setting up Facebook accounts (yes, there are people that still do not have a Facebook account) and other social media applications. Ndoro Kakung spoke next and he shared his insights on his blogging experience, who makes up the Netizens of Indonesia and whether one should consider becoming a netizen. And indication of the workshop’s success was the fact that almost all of the participants stayed till the end (normally seminar and workshop sneak out for some shopping or back to their work if they find that the session was boring or not useful). 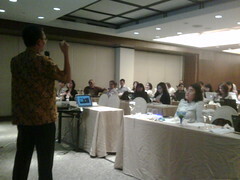 Another indication was that all of the participants said that they found the workshop eye-opening. Many of them said that they had little or no idea that New Media could potentially be so powerful a tool in the field of PR. Many of them also wanted more information on some of the topics that were touched upon. All this made us feel good as it is part of Maverick’s aim to give a bit more back to the PR profession this year. We feel that the PR profession could be much better if someone or some PR firm would take the lead in providing quality training for PR practitioners, including in-house PR practitioners. We feel that much of the training being conducted are stilted, boring and way, way behind the times. We thought that initiatives such as this, instead of the umpteenth self-serving survey result, would help raise the bar in the PR profession and judging from the response of the participants, we filled a need. What next? Hmmmm…perhaps a workshop on crisis and isues management?